Our first demo lesson is Amy Carroll. Amy begins talking about how her school handled writing instruction in an overly prescriptive way. Some call this TEEEC (topic, evidence, conclusion), the hamburger paragraph, the Jane Schaffer program, or, in Amy’s case, the Proper Paragraph format. Standardized and rationalized. Many heads nod in our room. We’ve all experienced this in some form or another. This sort of 5-paragraph didacticism is often coupled with groans and moans about how today’s students can’t write. There is a definite relationship between these two ideas. Now isn’t the time to suss it out. Amy decided to go rogue and immerse the kids in a genre study using op-eds. A proactive vs. reactive approach. Q1: What do you think when you hear the words “persuasive essay”? What are some topics of persuasive essays that you have written in the past? So, I sort of have to sit and think about this one. Normally I can unleash my inner logorrhea at a moment’s notice when it comes to these things. So, what is it about persuasive writing that stymies me? I didn’t have my students do really any persuasive writing last year, now that I think about it. 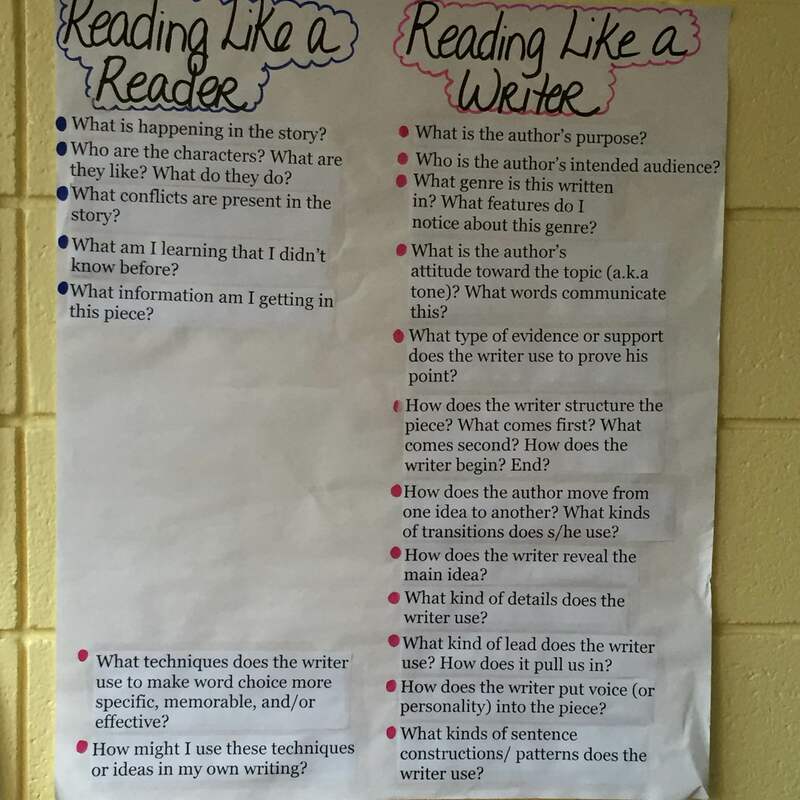 As freshly-awakened teacher, I didn’t want to do anything that reeked of traditional school writing. Traditional school writing, to me, is a prompt about whether or not students should wear uniforms. Or if cell-phones should be allowed in schools. Of topic, evidence, connection, conclusion. Inauthentic statements written for nonexistent audiences. I associate persuasive writing with the kind of anemic, formulaic composition I wanted to get away from. This is, of course, not really true, Anything can be exciting; it’s all about how you approach it. So, I’m looking forward to hearing about how to use persuasive writing in an exciting way. That last sentence definitely reads as a conclusion but we’re still going, so I need to type more. It’s hard just riffing on something! Ok, that’s it. Then we turn and share with our partners. My neighbor has a slightly different take. She remembers the feeling of excitement when a teacher gave her the assignment of writing about whether or not her school should teach a particular book. She also says that all writing is persuasive in a way. We share out to the whole class. We’ve all assigned the cell-phone/uniform topics, probably because we thought they would be interesting! Others share out their own experiences as a student with persuasive writing. Some talk about persuasive writing as a tool of autonomy for students. 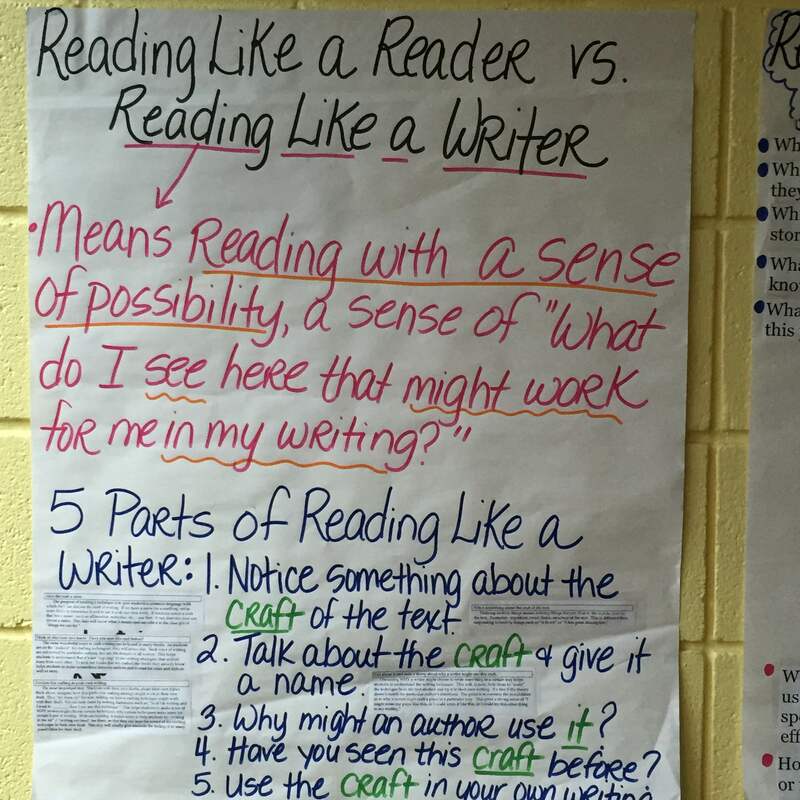 Some of us talk about how these prompts lead students to write what they think the teacher wants to hear. Or that much persuasive writing forces us into false dichotomies. Is X good or bad? A sort of all-or-nothing thinking that severely limits the scope of dialogue. Amy uses Edmodo, btw. She talks to us about living a paper-free life. I must admit, I’m currently incapable of thinking rationally about education technology. Ever since I started reading Audrey Watter’s blog, I have a knee-jerk reaction to ed tech. This is another example of how naive my understanding is of, like, everything. I have to progress through this naivete before I’m capable of thinking about technology in the classroom in an un-extreme way. She recommends using Law and Order episodes to help teach introductions and conclusions. Amazing. Amy passes out the model text for today’s demo lesson, a NYTimes piece about vaccines, Disneyland, and Measles. This is standard operating procedure. A whole-group read aloud without purpose for the first run. Just to get into the rhythm of the piece. The language. Read through the piece first. Then, read it as a writer. What do you notice about the sentence structure? The punctuation? The organization? We talk aloud through the ‘Reading like a reader’ questions. What is happening in the piece? Who is involved? What conflicts, if any, are presented? What info am I getting in this piece? A set of questions to really help us get our feet wet and wade into the article. Then we move into ‘Reading like a writer.’ She projects the article on the board. She makes her thinking public (also known as Think Aloud Protocol) as she reads through sentence by sentence. “When I see this, I notice that…” “I see the author did ____ by _____.” We see the figurative language, the use of pathos. So what we’re doing here is a close reading. This is the power of the mentor text. To allow students the opportunity and space to notice. She tells us to go through the rest of it to pick out elements. Pick a lens and go at it. What are you interested in as a writer? Communicating a particular tone? Using evidence to prove a point? Narrow your gaze to that and see how the article does it. Amy tells us to make sure you start your genre study out with an unassuming, unclever piece. This makes it easier to figure out what the defining characteristics of a genre are. Amy takes weeks to go through mentor texts in a genre study. She puts them up on Edmodo. 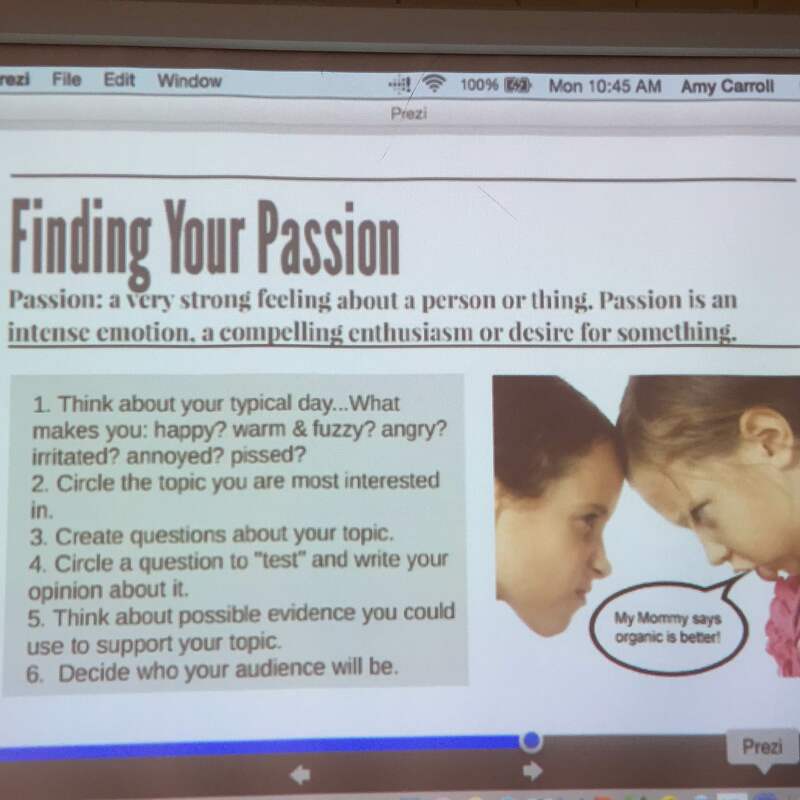 Once we’ve gone through the mentor text stuff, we try to find our own passion. Passion isn’t necessarily a love thing, just anything you feel a massive emotional charge about. We think of a couple of examples of things we’re passionate about. 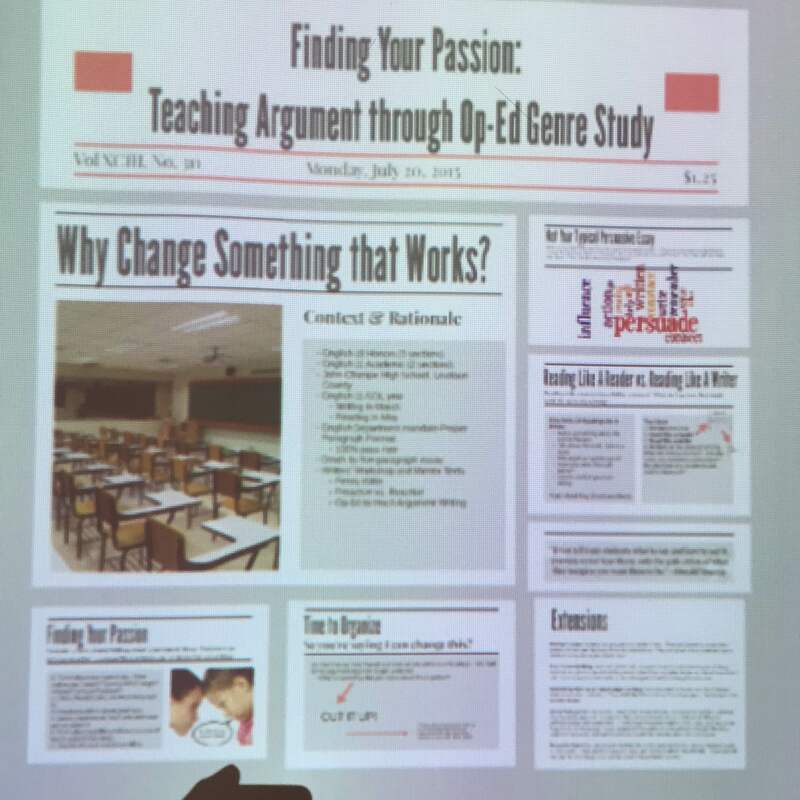 Then, we move through a few well-constructed organizers taking us from passion to editorial topic to writing controversial questions to thinking about your evidence. She then has us cut it up. Rearrange words, paragraphs, sequence, etc. It’s a cool way of writing and prewriting and revising. You don’t have to start with X. No two editorials are the same using this method (which works for pretty much any other genre, btw). Amy has many shout-outs. Penny Kittle, Jim Burke, the Serial podcast, Katie Wood Ray, and more. What a fantastic presentation! Time for a quick break before we’re back into it.